World of Warcraft: Legion's final boss, the mythic difficulty version of Argus The Unmaker, took players by surprise when he (un)made his first appearance in the game last week. Top guilds expected a cakewalk. Instead, they got thrashings. Hundreds of them. Finally, though, Argus has fallen. Method, a guild recognised by many as the best in the game, did the deed today, after nearly a week of nonstop attrition and setbacks. In the end, they wiped 320 times before finally knocking off Argus, presumably named for his love of both alternate reality games and each and every one of us. That brings Method's total number of Legion world firsts to three of a possible five. 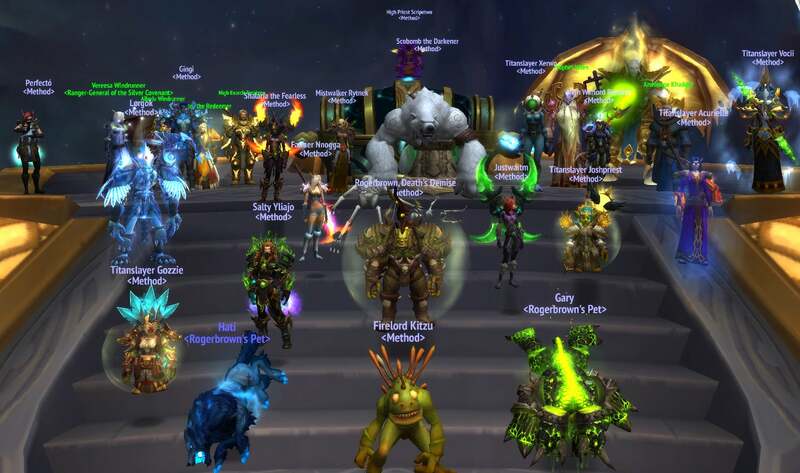 Guild officer George Georgiadis tweeted that he didn't think Argus was quite as tough as Tomb of Sargeras boss Kil'jaeden, but was "still quite a tough one - heart was going BOOM BOOM BOOM." The race to beat Argus was a tight one. Top guilds such as Limit were also in the running, though a healer who decided to DDOS his own teammates derailed their efforts slightly. Guilds have been stymied by Argus' mythic form because it includes secret phases that other difficulty levels don't. While Method has yet to reveal the exact method they used to bring down the very tough blue (and sometimes red) boy, it's likely that we'll learn more about exactly how the fight unfolded in the near future. I kind of want an MMO to come out, where bosses can only be killed once. And once there dead, that's it. No one else can kill them. Think Sward Art Online, but without the dining in RL. Hahahahaha jeez that would be insane. If that were the case I would hope the developers put lots of bosses into the game. 1990's clanlord, still going to day, there is no max level, in fact there is no other leveling system out there that can match it. Everquest had that with a single boss. The Sleeper. Could only ever be woken once on each server, after which the loot drops in his zone changed, with some things no longer dropping. That made them increasingly rare and valuable over time. One server managed to wake and kill him, which wasn't meant to be possible. I think the original Star Wars Galaxies also had one off bosses that never respawned as well. Problem with single shot bosses is the amount of effort put into making them. If its a one and done approach, you waste that. As @benredbeard says, they'd need a lot of bosses, which would defeat the purpose of making them unique. It would also then be a race only the elite guilds would be able to do. So you'd be condemning any guild outside the top 10 or so to never be in a position to raid to that level. Perhaps it would work if that first kill was of the original, with unique loot drops, and all subsequent kills being clones, or some other "lesser" kill with a more standard loot drop. Make that first kill really mean something, which I think would be enough. normally i play the expansion for the story line, because you have to became a mathematician do any thing else but they where super boring. Blizzard really is in a catch 22 with raid difficulty. If they make it too easy raiders demand the bosses are harder. Yeah I think they have got a pretty good balance. I think it is the unknown parts of higher tier raids that pushes the limits of raiders.